- Select "Regional and Language Options" - Select "Regional and Language Options"
- Select "Advanced" - Select "Advanced"
Mixed menu in russian and english, no graphical chess stones - thats not enough. Maybe this program need some development. Can you play own engine-tournaments on the internet with it? You can choose between Bright and Stockfish in this program. But I'd like to play with my own choice off UCI engine (and settings) + book to play against other competitors. So I haven't found the option to setup my own UCI configuration. Is there perhaps an other way to play on the internet with you're own choice off UCI engine + book? 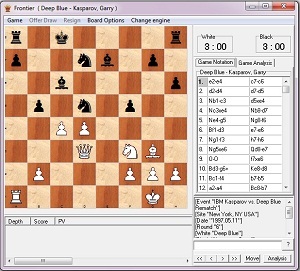 On playChess.com you are not allowed to play with IvanHoe / Ippolit / Houdini engines etc. On FICS it seems that you won't get a computer account to play with.